When a person dies, he is dead, that is, totally without life. A Christian has body, soul, and holy spirit; so, we will look at what happens to each of these components if he dies. The body cannot live without the animating life force of the soul, so when the soul is gone, the body is dead. We have all seen lifeless bodies—the body is there but the soul, the life force, is gone. Just as the body is not alive without the soul, so the soul cannot live on its own without a body. The soul is not a ghost that lives on after the body dies. Rather, it is the animating force that makes the body alive. God created the soul, the life force, for both animals and man and it is passed down from one generation to the next. There was no “soul ghost” that God put into us when the sperm of our father and egg of our mother came together. Every living part of a human or animal has “soul,” that is, life. Every cell of our body has soul in it, which is what makes it alive. A dead cell is a cell without soul—the soul is gone. As with every cell, the egg from my mother and the sperm from my father that became “me” each had its own cell-body and soul, and that soul was passed down to “me” when the sperm fertilized the egg. If the egg were “dead,” the lifeless egg-body would be there, but it could not be fertilized; and if the sperm were dead, it could not fertilize the egg. When a human cell dies, the life in that cell does not go to be with God, it is just gone. Similarly, the soul that makes the egg and sperm alive does not live on in the presence of God if the sperm or egg dies. Men have millions of living sperm, sperm with soul, that die; and women have hundreds of thousands of living eggs, eggs with soul, which are never fertilized and die. The soul in all those sperms and eggs does not “go” anywhere if the sperm or egg dies, and certainly not to be with God, rejoicing in His presence. As with the life in any cell, it just dies and is gone. On the other hand, if the sperm fertilizes an egg, then the life in them is passed on and becomes the life of the new baby. The Bible says that God created the same life force, called “soul,” for both animals and man; but it is hard to see that in most English Bibles because the translators say “soul” when the verse refers to humans, but use other English words such as “creature,” “thing,” “life,” etc., when the verse refers to animals. The soul, the life, in animals and in mankind does not “go” anywhere when the animal or person dies, it just ceases to be. Interestingly, most Christians recognize that about animals and realize that animals do not go to heaven or “hell” when they die. Their body decays and their soul is gone. What we need to understand is that the Bible says people and animals are alike in that, when they die, their body decays and returns to dust and their soul dies too. That is one reason why there are verses, some of which we will see in this article, that say that when a person dies, his soul is in “Sheol,” the grave or the state of being dead. For the record, the “spirit” that returns to God in Ecclesiastes 12:7 is the ruach, the animating life force in a person. If we die, God and the Lord remember us, and the Lord Jesus will re-energize our bodies with holy spirit at the Rapture. The holy spirit God gave us did not have a mind or memory before it was given to us and it does not have one after we die. It is spiritual life, spiritual power, that we have from God. My “spirit” is not rejoicing with God after “I” die. A person is alive only as an integrated whole before he dies and only as an integrated whole will he live again when God raises him from the dead. The Bible has a significant number of verses that let us know that when a person dies he is dead and awaiting the Rapture or resurrection. Many are self-explanatory, while some need some explanation to get the most from them. It is not the purpose of this short article to replace much larger books on the state of the dead, nor can we mention every verse or argument that supports the teaching that the dead are dead or give an answer to the more difficult verses on the subject. In fact, we have tried to print only the relevant part of each Scripture section, saving space by leaving out parts of verses, so it will be helpful if you read these verses in your own Bible for a more complete understanding of them in their contexts. In this article, we will give some of the important verses and pieces of evidence that the dead are not alive in any form but are awaiting being raised from the grave. The verses that follow focus our attention on the fact that the dead are dead, “sleeping” in the ground and turned back to dust. They are not alive in heaven, hell, or Paradise. God told Moses he would “sleep” with his ancestors not that he was going to heaven to be with God or his ancestors. God made it clear that Moses was going to sleep—a state that, for Moses, will end with the Resurrection of the Just. “Sleep” is an excellent metaphor for death because a sleeping person is not participating in life’s activities but will wake up as the same person who went to sleep. “Sleep” is often used of death (Job 7:21; Ps. 13:3, 90:5; Dan. 12:2; John 11:11; 1 Cor. 11:30, 15:51; 1 Thess. 4:14, 5:10). The fuller metaphor of sleeping with one’s ancestors occurs in 2 Samuel 7:12; 1 Kings 1:21; and Acts 13:36 of King David. (12) so a man lies down and rises not again; till the heavens are no more he will not awake or be roused out of his sleep. (13) Oh that you would hide me in Sheol, that you would conceal me until your wrath be past, that you would appoint me a set time, and remember me! (14) If a man dies, shall he live again? All the days of my service I would wait, till my renewal should come. When a person dies, he “lies down” in death and does not rise out of that sleep until his “renewal” at the resurrection. Job’s saying he would be hidden in Sheol (the state of death) makes no sense if he believed that at his death he would be with God in heaven or in a good place. People who die are not in the presence of God. They are dead in every way and, in the sleep of death, do not remember or praise God. (12) Man in his pomp will not remain; he is like the beasts that perish. (14) Like sheep they are appointed for Sheol; Death shall be their shepherd, and the upright shall rule over them in the morning [at their resurrection]. Their form shall be consumed in Sheol, with no place to dwell. The “soul” in man is like the soul life in animals. It is not immortal, so it dies when the person dies. Christians who die remain in Sheol, the state of being dead, until God ransoms us from the grave at the Rapture. At that time God re-empowers our bodies but not with the soul life we have now. The dead are not in the presence of God praising Him. They are in “silence” until the Rapture or resurrection. (4) But he who is joined with all the living has hope, for a living dog is better than a dead lion. 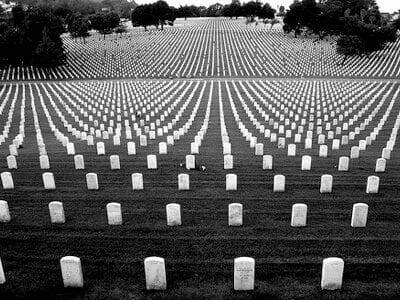 (5) For the living know that they will die, but the dead know nothing, and they have no more reward, for the memory of them is forgotten. (6) heir love and their hate and their envy have already perished, and forever they have no more share in all that is done under the sun. (10) Whatever your hand finds to do, do it with your might, for there is no work or thought or knowledge or wisdom in Sheol, to which you are going. These verses are very clear. The dead are not celebrating in the presence of God. They are in Sheol, the grave, and there they have no knowledge, no love, no hate, no work, no thoughts, no wisdom. Dead people are dwelling in the dust, not in heaven. But there is a time coming when the graves will open and the earth will give birth to the dead. We have already seen that those in the grave have no knowledge or wisdom. There is no consciousness of any kind in death, so, of course, there is no “hope” either. (1) “At that time shall arise Michael, the great prince who has charge of your people. And there shall be a time of trouble, such as never has been since there was a nation till that time. But at that time your people shall be delivered, everyone whose name shall be found written in the book. (2) And many of those who sleep in the dust of the earth shall awake, some to everlasting life, and some to shame and everlasting contempt. The angel told Daniel that the people who were sleeping in the dust of the earth would awake in the resurrection, of which, Scripture tells us there will be two: the Just and the Unjust (John 5:29; Acts 24:15; Rev. 20:5 and 6, 11–15). God does not ransom “bodies” from the grave, He ransoms the whole person, who gets up in a new body. This verse could not be clearer. By the first century, no one had ascended into heaven. (29) “Brothers, I may say to you with confidence about the patriarch David that he both died and was buried, and his tomb is with us to this day. (31) he foresaw and spoke about the resurrection of the Christ, that he was not abandoned to Hades, nor did his flesh see corruption. (32) This Jesus God raised up, and of that we all are witnesses. If David was in heaven, Peter should have said so. Instead, Peter said just the opposite, that David “…did not ascend into the heavens….” His point was not that Jesus was in heaven with a body and David was in heaven without one. His point was that David was dead and Jesus was not. When a person dies, he goes to Sheol (the grave; the state of death) and returns to dust. Therefore, the Bible rightly directs our attention to the Rapture or resurrection, which is when people will be raised to life. (25) For I know that my Redeemer lives, and at the last he will stand upon the earth. (27) whom I shall see for myself, and my eyes shall behold, and not another. My heart faints within me! Job was excited about seeing God when he was in his new body, which would happen at the resurrection. He never spoke of being with God when he died. (12) Therefore prophesy, and say to them, Thus says the Lord GOD: Behold, I will open your graves and raise you from your graves, O my people. And I will bring you into the land of Israel. (13) And you shall know that I am the Lord, when I open your graves, and raise you from your graves, O my people. Speaking of those Old Testament Jews who believed, these verses are loaded with truth. Chief among that truth is that the people would know the Lord was God when He opened their graves and raised them up. If people’s “immortal souls” went to heaven when they died, that would be the time they knew the Lord was God, not much later when their bodies were raised. (25) Now there were seven brothers among us. The first married and died, and having no children left his wife to his brother. (26) So too the second and third, down to the seventh. (27) After them all, the woman died. (29) But Jesus answered them, “You are wrong, because you know neither the Scriptures nor the power of God. (30) For in the resurrection they neither marry nor are given in marriage, but are like angels in heaven. This powerful section of Scripture is also recorded in Mark 12:18–27 and Luke 20:27–38. The Sadducees did not believe in any form of life after death. They rightly understood Jesus’ message that the dead would get up “in the resurrection” so they asked whose wife the woman would be at that time. If Jesus believed that after a person died his soul lived on, this was the perfect place to say that one’s soul or spirit did not marry in heaven. Instead, because he knew dead people are dead until the resurrection, he said “in the resurrection” people will not marry. If people went right to heaven or “hell” when they died, they would be repaid for their actions immediately after death. We are repaid after we rise from the dead, which is what Jesus taught. (21) Martha said to Jesus, “Lord, if you had been here, my brother would not have died. The Bible has many accounts of people being raised from the dead. At no time did Elisha, Jesus, Peter, or Paul pray to God before raising the person to see if they would be willing to leave heaven and return to this fallen world where they would only have to die again someday. Furthermore, if the people who had died were in heaven, it certainly seems that they would have had something to say about what heaven was like when they returned. Even if they promised God they would not talk about heaven, it seems that someone would have asked them about it. Jesus told his disciples they would be with him when he came again not when they died. (2) greatly annoyed because they were teaching the people and proclaiming in Jesus the resurrection from the dead. The Apostles were not teaching that people went to be with Jesus when they died. If they had been, that is what the religious leaders would have been upset about. Instead, the Apostles were teaching the resurrection from the dead. Other verses confirm that the Apostles taught the resurrection (Acts 17:18 and 32, 24:15). (42) So is it with the resurrection of the dead. What is sown is perishable; what is raised is imperishable. (52) in a moment, in the twinkling of an eye, at the last trumpet. For the trumpet will sound, and the dead will be raised imperishable, and we shall be changed. It is very important to note that every believer is “raised imperishable” at the same time: “the last trumpet.” We do not have an imperishable immortal soul that lives with Jesus after we die. We become “imperishable” only when we are raised from the dead. (13) But we do not want you to be uninformed, brothers, about those who are asleep, that you may not grieve as others do who have no hope. (14) For since we believe that Jesus died and rose again, even so, through Jesus, God will bring with him those who have fallen asleep. (15) For this we declare to you by a word from the Lord, that we who are alive, who are left until the coming of the Lord, will not precede those who have fallen asleep. (16) For the Lord himself will descend from heaven with a cry of command, with the voice of an archangel, and with the sound of the trumpet of God. And the dead in Christ will rise first. (17) Then we who are alive, who are left, will be caught up together with them in the clouds to meet the Lord in the air, and so we will always be with the Lord. If Paul wanted Christians not to grieve and knew that when people died their soul or spirit went to be with God, he would have said so here in order to help comfort people. Instead, he tells us that all the dead in Christ will rise at the Rapture when the Lord comes and comforts us by letting us know that even when a person dies he will rise again. Our hope is the coming of the Lord because that is when the dead are raised and can be with Jesus. (4) Then I saw…the souls of those who had been beheaded for the testimony of Jesus…. They came to life and reigned with Christ for a thousand years. (5) The rest of the dead did not come to life until the thousand years were ended. This is the first resurrection. These verses separate the people who come to life in the first resurrection from those who do not. The souls of the righteous, meaning righteous people, come to life after the Battle of Armageddon (Rev. 19:11–21) and reign with Christ. (11) Then I saw a great white throne and him who was seated on it. From his presence earth and sky fled away, and no place was found for them. (12) And I saw the dead, great and small, standing before the throne, and books were opened. Then another book was opened, which is the book of life. And the dead were judged by what was written in the books, according to what they had done. (13) And the sea gave up the dead who were in it, Death and Hades [the grave] gave up the dead who were in them, and they were judged, each one of them, according to what they had done. These verses depict the Resurrection of the Unjust (Acts 24:15 – ESV), also called the Resurrection of Judgment (John 5:29 – ESV), and the Judgment that follows immediately afterward. At this future time, all the unjust people will get up and be judged. The souls of the wicked are not judged and thrown into Gehenna when the person dies. If people died and went to heaven or “hell,” it would mean that their judgment had already occurred, for no one could be allowed in heaven or sent to “hell,” (more properly, burned up in Gehenna) before they were judged. However, Scripture is clear that the Day of Judgment is still in the future. Jesus said that the Day of Judgment for Sodom and Gomorrah is still future, but those people died about 4,000 years ago. It is obvious that after they died they were not judged but still await the resurrection and Judgment along with everyone else who has died. The verses on the coming Day of Judgment are too many to print in this short article but some clear ones that show that it is future include: Matthew 11:22 and 24, 12:36; 2 Pet. 2:9, 3:7; Jude 6. (41) The men of Nineveh will rise up at the judgment with this generation and condemn it, for they repented at the preaching of Jonah, and behold, something greater than Jonah is here. (42) The queen of the South will rise up at the judgment with this generation and condemn it, for she came from the ends of the earth to hear the wisdom of Solomon, and behold, something greater than Solomon is here. In these verses Jesus makes the general point that people will get up in the future at the Judgment. He was not being specific about the two resurrections (he was clear about them in other places), nor was he trying to justify or condemn any one person, but was showing that in the resurrection, when everyone gets up, they will together condemn those who rejected Jesus. All the people Jesus mentioned, “The queen of the South…” (who is the Queen of Sheba and lived in the 900’s B. C.), the men of Nineveh (800–750 B. C.), and the people Jesus preached to (about 30 A.D.) all will, in the future, get up with each other at the Judgment. All the dead will be raised and judged at the same time in the judgment appropriate to them. (47) “Again, the kingdom of heaven is like a net that was thrown into the sea and gathered fish of every kind. (48) When it was full, men drew it ashore and sat down and sorted the good into containers but threw away the bad. (50) and throw them into the fiery furnace. In that place there will be weeping and gnashing of teeth. Jesus taught in this parable that the Judgment is future, “…at the close of the age….” It is then and only then that evil people will be separated from righteous people. Jesus taught a similar lesson in the parable of the weeds of the field (Matt. 13:36–42). People are repaid for what they have done in life when Jesus comes and they are raised from the dead, not when they die. Every person who has ever lived will be judged by the Son, which will occur in the future. Before Jesus died and rose again, these words could not be fulfilled. (29) and come out, those who have done good to the resurrection of life, and those who have done evil to the resurrection of judgment. Right now, dead people are “in the tombs.” In the future, they will be a part of the Rapture of the Church or one of the two resurrections. Jesus spoke of the “resurrection of life” because in that resurrection people are raised to everlasting life, while in the “resurrection of judgment” the vast majority will be condemned to Gehenna and burned up. The Greek text of this verse is very clear that the Judgment is coming in the future. Some English versions say “will judge,” some say, “is going to judge,” and some say “is about to judge.” This verse shows that people who have died have not been judged yet, so it goes without saying that they cannot be in heaven or condemned to Gehenna yet. (2) and of instruction about washings, the laying on of hands, the resurrection of the dead, and eternal judgment. Note in these verses how the foundational and elementary doctrines of the Christian faith do not include going to heaven or “hell” when we die, but rather the “resurrection” and the “eternal judgment” which follows it. Some of the angels (fallen angels, which we sometimes refer to as demons) sinned so grievously that God is not allowing them to be free, but instead is keeping them in chains until the Day of Judgment. Thus, even angels are not judged immediately but await Judgment Day. Another verse saying some angels are awaiting the Judgment is 2 Peter 2:4. When the demons spoke to Jesus, they asked if he were going to torment them “before the time,” meaning before the Day of Judgment (Matt. 8:29). We have now seen a large amount of Scriptural evidence that those who have died are not alive but are dead and awaiting the resurrection. On the other hand, the Devil has a vested interest in getting people to believe that the dead are alive. For one thing, it allows his demons to impersonate the dead and communicate untruths to mankind. For another, it makes the stark reality of death seem less of an enemy than it actually is. It also promotes ancestor worship, taking people’s attention off the True God. And it causes great confusion and concern about how people died and whether or not their “ghosts” are peaceful now. Thus, well meaning people try to discern how to make “dead people’s ghosts” peaceful or satisfied rather than simply realizing they are dealing with demons and casting them out by the power of Jesus Christ. The stark reality is that dead people are dead and that death is a terrible, horrific enemy, stealing our most valuable possession—our very life. The great comfort to Christians is that death is not the end of our existence because God will raise us from the dead in new, imperishable bodies and we will be with Him and the Lord forever. 1. Scripture quotations marked (ESV) are taken from The Holy Bible, English Standard Version™ © 2001 by Crossway Bibles, a division of Good News Publishers. All rights reserved.